Reacting to the overcrowding of Seoul and the need for a more geographically centralized government, South Korea has initiated design and construction of a new city with government administration at its core and locagted two hours south of Seoul. 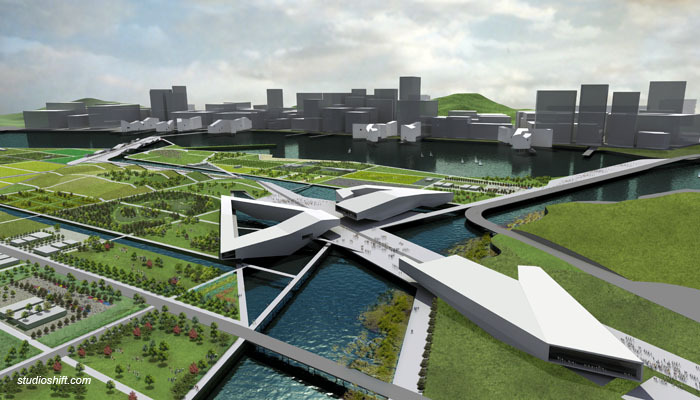 The basis of the competition was the design of a 12sq KM open space devoted primarily to park uses, but also housing major cultural institutions such as a design museum, performing arts complex and modern art museum, as well as residential and commercial programs. We began our investigation with the premise that the cultural institutions could act as an energizer for the park. If spread throughout the park at equal distances, their effectiveness as an attractor would be diminished, but if placed closely together, in a purposeful act of densification, their proximity could act as a vitalizer. 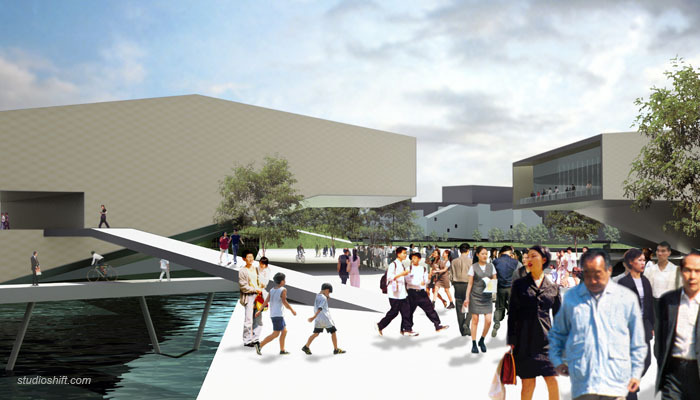 Located on crossing axes that connect site features, the cultural hub becomes the center of the park. The north/south axis links an off-site folk village and the sports complex. 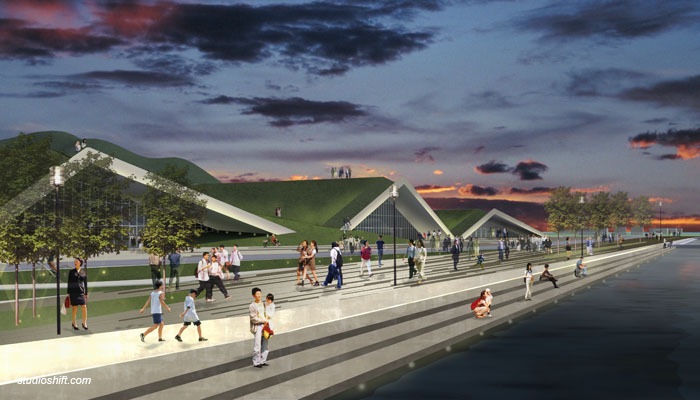 The east/west axis connects the dense city development to an amphitheater that was added to the program requirements to draw visitors to the center of the site. 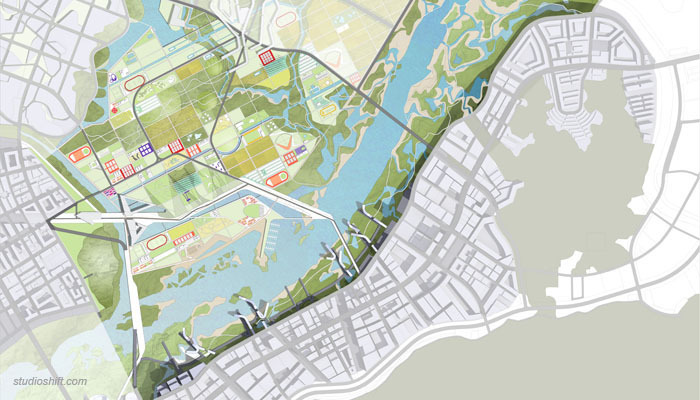 As well as being an active destination, the hub’s placement on the edge of the site forms a gateway between city and open space. The existing grid of the remnant rice fields is reinforced as pedestrian circulation crisscrossed by a system of streets. They become the boundaries within which differing program will be implemented over a planned phasing of 20 years. At each intersection one encounters a unique programmatic condition, standing at the point of convergence of diverse uses such as sports field, forest, windfarm and rose garden. Other uses include features such as formal gardens, playgrounds, ice rinks, solar energy fields, rice fields, wetlands, running paths, water reclamation sites, etc. Our proposal also stipulated a policy by which to fund the park. We proposed that the park act similar to the urban condition, in that each plot of land could be sub-divided as need dictated. The cost of development would be subsidized by a city-wide tax on large businesses moving into MAC. Cost would be proportional to the size of business, and would cover park maintenance for corresponding plots within the park. The park is poised to evolve, similar to a city, in that over time uses differentiate and the program size and arrangement will change to meet necessity or desire. The project will not lie as a static formal construction within a bustling city.